The prevalence of co-morbid chronic physical and behavioral health conditions is an established driver of spiraling costs and poor health outcomes among Medicaid recipients. States are increasingly deploying new managed care models to help control Medicaid costs and promote improved health outcomes. 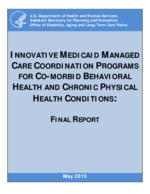 This study examines innovations in the coordination of care for Medicaid covered individuals with chronic physical and behavioral health conditions. Six geographically dispersed Medicaid managed care health plans serve as detailed case studies, and findings from these are reviewed.